“The Reunion” started out as part of a personal journal or diary that I used to keep. Later I shared it with a few friends and some online friends on CompuServe. They encouraged me to try to publish it. I wouldn’t listen at first. Then one day I saw an interview with Deborah Paul on the local news. She was editor-in-chief of Indianapolis Monthly Magazine. She said that she never felt like a life experience was complete until she had written about it. That so precisely echoed my feelings about why I liked to keep a journal that I thought I would give it a try and submit the story to her for publication. Mostly I did it just to get people off my back who kept telling me I should publish it. I just wanted to prove them wrong. It is WAY too long. Just because they never publish first-person essays doesn’t mean they can’t start. Hey! I’m the editor. I say what does or doesn’t fit the general format! It is still WAY too long. “Chris, you’ve put your soul on paper”, she explained. “We only want half your soul”. She said they would agree to publish a shorter version or I could try to get the whole thing published elsewhere. If I stuck with them, she said she would normally edit it herself but since this was such a personal story she would let me cut it first. I cut about 40% and resubmitted it. They cut a few more things and even put back a paragraph or two. I’ve got a copy of the uncut version somewhere. Perhaps someday I will post it online although since this is the version that was published it’s really more important to me that the “authors cut”. After that “Indianapolis Monthly” began regularly publishing articles written in first person. After the article was published I got lots of phenomenal responses from friends and family. I also heard from some of the people mentioned in the article including Rosie. She was extremely flattered at how I had described her. Again we talked about keeping the friendship going but part of the reason that I wrote “The Reunion” in the first place was I needed to put some painful memories to rest. After the phone call in which we talked about the publication of the article, I never spoke to her again. I did hear that she had a baby but then sadly she passed away a few years after that. I got a note from the brother of Nancy and Leslie Gilson. He said that he did not recall the incident that I described about Nancy’s reaction to Leslie’s death. But he could not deny that it happened. As far as I’m concerned it was sort of the “Man Who Shot Liberty Valance” Phenomena which had the famous line “When the legend becomes fact, print the legend.” The Gilson family had become literally legends. The girls were memorialized by a large donation to establish a library at Roberts School. Hundreds of books bore a label saying that the book had been donated and their memory. I also got a phone call from former janitor John Sementa who I had described as “whereabouts unknown”. He called to say “I’m right here”. In fact he had been at the reunion at I did not see him there. Regarding Rosie… I spoke to her on the phone after the article was published and she was extremely flattered especially the way that I described her. Again we talked about getting together someday but never did. I later heard that she and her husband had a baby. My cousin Nancy ran into her while sharing a ride with Rosie and her baby on an accessible bus. According to ancestry.com she passed away on October 29, 1993. I’ve done Google searches Facebook searches for other classmates. I found Cheryl Fayette on Facebook unfortunately she passed away in 2015 shortly before I found her. See this blog article about her. Also found obituaries for Estel Troxel and Carl Nash. Recently made Facebook friends with a guy named Sean Tosh who went to Roberts School and was at the reunion but he was a few years behind me and I don’t recall him at school. I did not see him in the video. “Indianapolis Monthly” had an exceptionally good year in 1987. The Community Service Council found five articles in IM (among them “The Reunion”) worthy of its “CASPER” award but thought it unfair to give five awards to one publication. So they concluded they’d give Editor Deborah Paul an award for picking five great pieces. I got to go to the awards presentation and get my picture taken with Ms.Paul and the other four authors but the award itself hangs on her wall — not mine. Then the “Indiana Chapter of the Society of Professional Journalists — Sigma Delta Chi” voted “The Reunion” as “Best Magazine Feature 1987”. The awards presentation was much nicer and lots more fun. The plaque is nicer looking an that baby is all mine! It hangs on MY wall. Here is a rather blurry faded photo from the award ceremony. 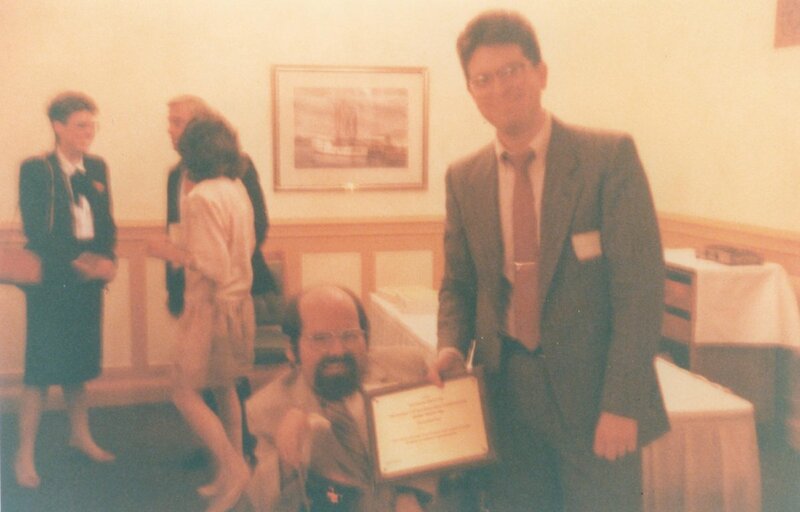 I don’t recall if the guy standing next to me was the representative from the SPJ who presented me with the award or if he was someone from Indianapolis Monthly. The school underwent a minor renovation after it was closed. I went back there in the late summer of 1987 to shoot the photos that accompanied the magazine. It was repurposed as something called the IPS Key School, which featured a unique curriculum based on the theory of multiple intelligences. Following the Key School, Horizon Middle School occupied the building until 2006, when IPS vacated the structure. Finally in 2017 it was renovated yet again to turn it into an apartment building with 30 units. Here is an article recounting that story. The building is now known as “Roberts School Flats” and they have their own Facebook page you can find here. The therapy department is now considered a penthouse suite. The porch behind the therapy department where I tried to kiss my girlfriend Rosie is now a very nicely furnished patio. Here are some photos from the Facebook page. The day of the reunion I shot some VHS videotape. I watched it a few times but some of the memories were too painful. However recently I downloaded the video to my PC, edited it, added comments and voiceovers as well as open captions. Here it is on YouTube.